But when I went to turn off the hose, I was greeted by a massive pool of water, mud, mulch, and grass clippings just under the faucet. Clearly, water had been pushed in and out of the hose. However, I could tell a large amount had also leaked from the outdoor water faucet and started to build up. This got me thinking — the same thing could happen with sequencer equipment. As daunting as it might seem, we all know our sequencers need constant maintenance and attention. Every moving part has an important function, no matter how tiny. One of the tiny parts to check regularly on the ABI 3130/xl, 3730/xl, 3500/xl is the piston. If neglected, the polymer can back-flow into the pump motor, which can cause serious problems (and an expensive service visit) down the road. Our tip for avoiding that costly repair? Flush the water trap and keep those pistons squeaky-clean with these six easy steps. Before you start, make sure the pump is not in action. Performing this procedure while the pump is in action can cause additional damage. Fill a 20mL Luer fitting syringe with distilled water. You can use a larger syringe if you have to, but using anything smaller than a 20mL may generate excessive pressure within the trap and cause further damage. Be sure to get all of the bubbles out of the syringe before you start the next step. Turn the top-front fitting counter-clockwise to loosen it. You don’t want to remove the fitting, just loosen it enough to attach the syringe to the fitting. 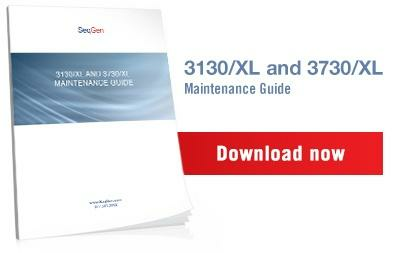 For 3130/xl and 3730/xl, make sure you turn the exit fitting loose on the top-left, too. Attach the syringe to the fitting. You’ll probably have to hold the fitting steady while you thread the syringe into it. Then, slowly start injecting the water into the pump. If you’re working on a 3130/xl or 3730/xl, you’ll need to hold a beaker under the exit fitting in order to catch wastewater, as shown in the picture below. The wastewater will be dispensed into the waste bottle. You may notice some bubbles in the channel as you’re completing this step, but this is normal and won’t affect the function of the pump. 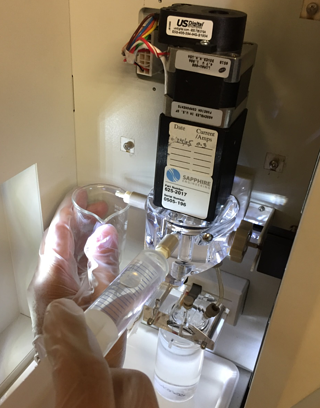 After all of the water has been dispensed into the waste bottle or beaker, remove the syringe and re-tighten the fittings by turning them clockwise. Don’t over-tighten the fittings or they could be damaged. They only need to be tight enough to prevent water leaks. Now you can remove the waste bottle from the instrument and clean it. Your water trap should be completely flushed and clear of any dried or degraded polymer. 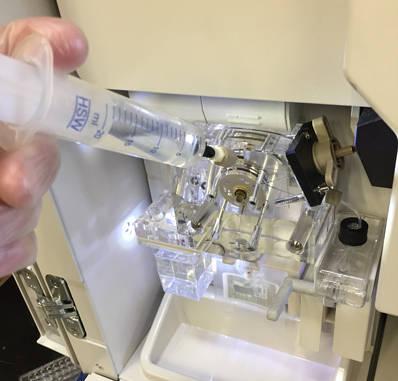 SeqGen recommends that you flush the traps on your ABI sequencers at least once a month to prolong the life of your pumps. By taking care of your machine and its various parts, you can eliminate unexpected machine downtime, reduce unnecessary wear on your instruments, and guarantee high-quality data. But as always, we are here to help should you need further assistance.